11/17/11 - 2011 OLOA Report posted - 201 Writeup link below. Lateness due to combination of LCMS and webmaster - but it's finally done! 05/21/11 - Finally caught up on Newsletters and Media Alerts - Sorry for the delay - webmaster's fault, not LCMS. Click on Newsletters and Media Alerts above for details. 0912, 1012 newsletters, and 1104 media alert. 09/18/10 - Just noticed an error on the 2010 OLOA writeup - corrected the link to the 2010 photo gallery. Why didn't someone tell me? 06/13/10 - 2010 Onel Lap writeup is posted - 2010 Writeup link below. 05/14/10 - May 14, 2010 Media Alert Posted - Click on Media Alerts above to view. 04/27/10 - April 27, 2010 Media Alert Posted - Click on Media Alerts above to view. Includes pic of NJMP Pace Car. Also, added new pic to front page. Laps to Conquer MS, Inc. was founded in 1989 to increase Multiple Sclerosis awareness through motor sports, while raising funds for the National MS Society. 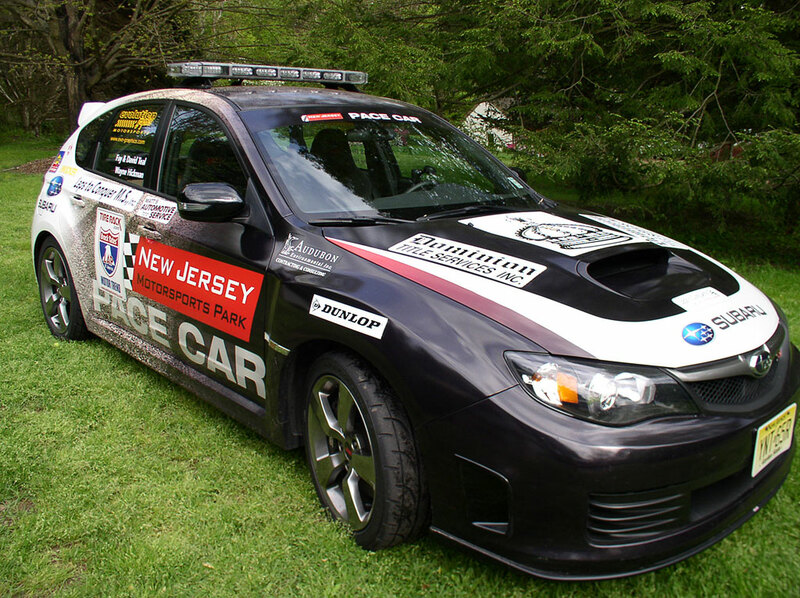 NJMP/LCMS Subaru STi ready to roll! Over fifty years after the National MS Society was founded, a cure of MS has still not been found —but much more is known about MS, and the end it in sight. Money is needed for research, and for the care of MS patients. So, LCMS continues the drive to increase awareness and raise funds. Multiple Sclerosis is a disease of the central nervous system that strikes nearly 200 new patients weekly. The disease afflicts adults, from late teens to early fifties, by short-circuiting the brain's ability to transmit messages to the muscles. The victim's motor, sensory, and bodily functions are affected. Race drivers and workers are invited to pledge pennies, dimes, or dollars for race laps scored, or race days worked, and to display the LCMS graphics. Pledges are enforced by the honor system — you tell LCMS how many laps were scored or days were worked when you submit a year-end donation. Your donations to the drive to end MS will be greatly appreciated. LCMS wants to continue the drive to end MS with your support. Fay Teal has had Primary Progressive MS since 1981 and is using her life-long interest in motor sports to help conquer this disabling disease. She is the Executive Director of LCMS. Fay received the 1989 "Achievement Award" from the Greater Delaware Valley Chapter of the National MS Society and the 1992 "Humanitarian Award" from the Delaware County (PA) Athletes Hall of Fame. The Greater Delaware Valley Chapter of the National MS Society recognized her for "Outstanding Service" in 1996. David Teal is the Assistant Executive Director of LCMS, and is Fay's husband. David is a past champion in Road Rally and Autocross. He holds a competition license, and a National Starter license from the Sports Car Club of America. If you have any questions, or would like to make a pledge or donation, or become a sponsor, please feel free to contact David and Fay by email, by phone (610-566-4795), or at the mailing address at the top of this page. If you have comments, questions, or suggestions about this website, please contact the webmaster.